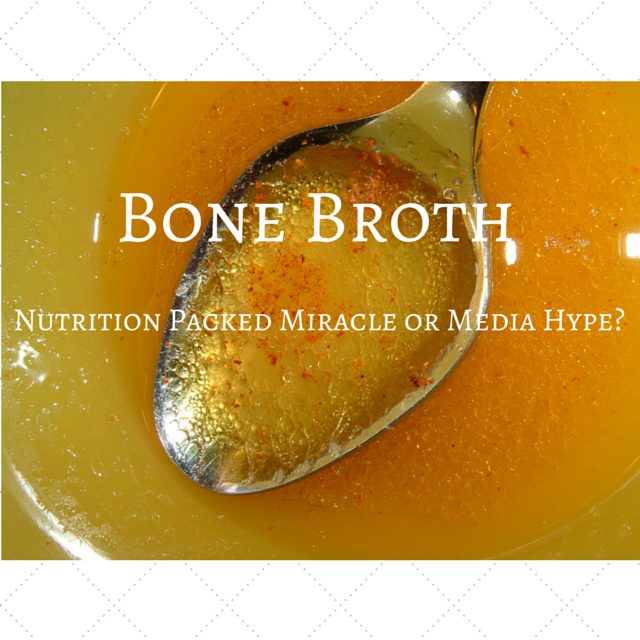 Bone Broth: Nutrition Packed Miracle or Media Hype? With the leading lady of The Fault in Our Stars and Divergent, Shailene Woodley, swearing by its benefits bone broth has been getting a nice amount of publicity. As someone with a love for anything clean eating related I just had to do my research on this “miracle broth.” While on my search I came across website after website making claims that would make you believe that bone broth was some type of ambrosia. Is bone broth really some nutritional miracle or is it just a bunch of hype? What is bone broth and how is it made? To try to answer that question let’s start with what bone broth is and how it’s made. Bone broth is a broth made with the bones of any animal. The bones simmer in water and an acid like apple cider vinegar for 24 to 72 hours. The long cook time allows for more nutrients to be pulled from the bones. I saw most recipes calling for the bones to be cooked in some way first. While there were a good few recipes that skipped this step, cooking the bones first adds more flavor to your broth. This is so simple even a kitchen newbie can do it. The broth can stay in the fridge for about a week. If you decide to freeze the broth you buy yourself 6 months. It’s best to use bones of a high quality, so try bones from a healthy, well-raised animal. Who wants to waste 24 plus hours for poor quality broth? Also, since the broth will simmer for so long using a crock pot was widely suggested for safety and heat control. Alright, so this broth takes between 24 to 72 hours and a pretty penny on quality bones to make. While doing my research I thought, “This broth better have some major benefits for all this trouble.” I found claims of bone broth being able to have you in top shape inside and out. Bone broth is high in of protein, minerals, and collagen. The broth is said to aid the body in healing itself and fighting off illness. Glycine is perfect for helping the body detox and it promotes a healthy gut. It is a perfect route for those who are sick or having GI trouble to get nutrients. The nutrients in bone broth are broken down into an easily digestible liquid. Proline from the broth is perfect for healthy hair and nails. Collagen helps with joint health. A bone broth is also great for helping control inflammation. It seems that bone broth is not only full of amazing health benefits, but it’s simple to make. I have to be sold on the idea. Now it’s time to start drinking a gallon of the stuff every day. Right? Wrong. I don’t believe bone broth is the miracle worker people say it is. When you think about it bone broth has been around for ages. We all know nothing works like chicken noodle soup for a cold. I wanted to believe there was some all curing broth and I’ll definitely be adding it to my diet. It’s just that my research also pointed out holes in how powerful bone broth is. Collagen cannot be absorbed into the body whole. The broth’s long cook time takes away from the full nutritional punch. With all the hype I feel that people are going to turn to bone broth, like they do most “superfoods”, and expect it to magically make them healthy. Using bone broth as a small part of my overall healthy eating routine sounds like the most reasonable option. I plan on using bone broth in soups and freezing some to have on hand in case of a cold. There is just no way that you’ll catch me downing it like water.